Kingdom of Thrace - Byzantium. 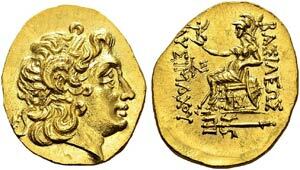 Gold stater in the name and type of Lysimachus, ca. 195 BC. Obv. 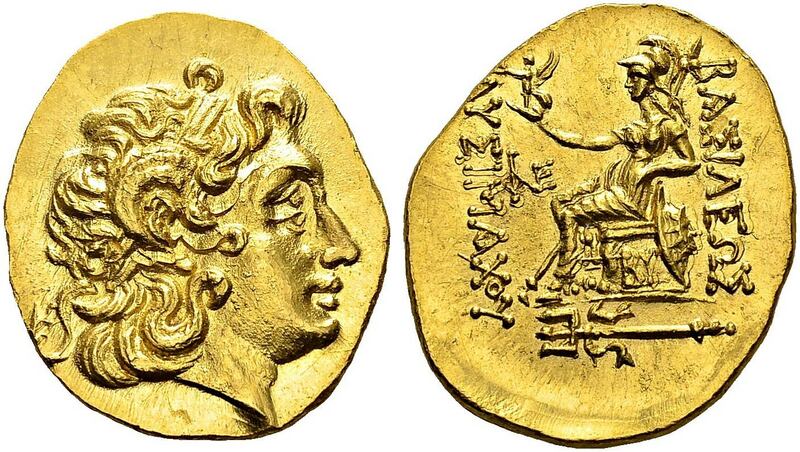 Diademed head of the deified Alexander right, with horn of Ammon. Rev. ΒΑΣΙΛΕΩΣ - ΛΥΣΙΜΑΧΟΥ. Athena Nikephoros seated left, left arm resting on shield, transverse spear in background; monogram to inner left, BY below throne, ornate trident in exergue. Henri Seyrig, ”Monnaies hellénistiques de Byzance et Calcédoine”, Mélanges Robinson, n° 11 var. (different monogram but same portrait style). Gold. 8.53 g.
Ex. Rauch auction 71, 28 april 2003, lot 108.